Great Sand Dunes National Monument, CO.
Ilford Delta 100. Polarizing and UV filters. love the look of the dunes. nice, Will. Dunes with their shadows make great BW images. Nice job. Soothing undulating waves of sand and great light. Very nice. Beautiful capture – excellent composition. Excellent! You can just imagine the wind coming up and shifting all those grains of sand! There is so much grace in the lines and curves of the landscape here. Gorgeous. lovely imagination and great tones. nice shot. amazing shot. really beautiful in b&w. 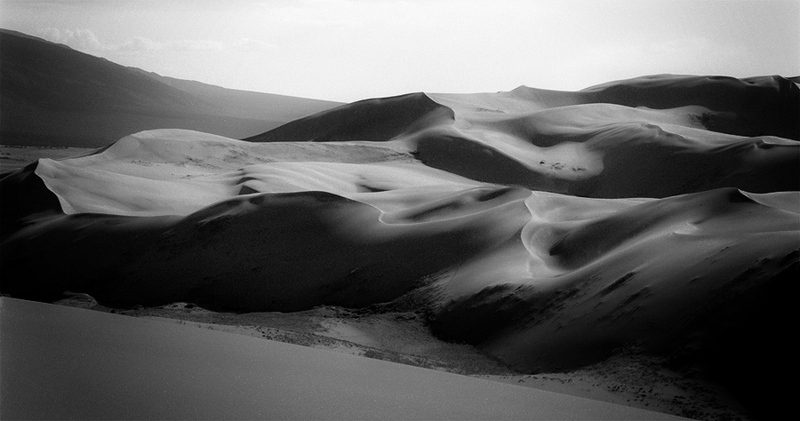 A beautiful B&W for these dunes. Cheers. very nice toning and contrast! great work in bw! This is really stunning Will. I love the smoothness of the landscape and the perfect tones. Oh what magic dunes! Simply magnificent capture! A most pristine scene with gorgeous light. love the faint clouds dissolving into the light. All beautifully rendered. The wind is an amazing power. It's formed a beautiful work of art in the sand. Wonderful image. Beautiful! Looks really great in b&w, also. this is definitely a 'wow' image!